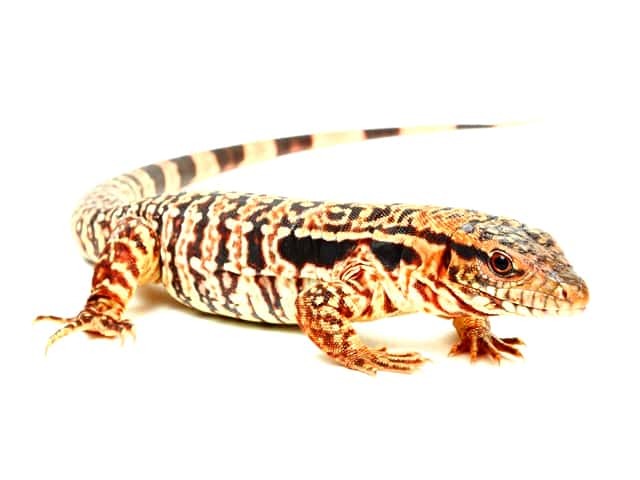 Red Tegus are born a dull reddish brown, color that increases as the tegu matures. Males generally develop their adult coloration at 18 -24 months of age, and the typical adult female coloration is reddish brown with white spots. Red Tegus are the heaviest of all tegus. Males develop large jowls and tend to be the largest and the most brightly colored. They can be tamed and are very docile. Tegus have a very large feeding response and will usually attempt to eat anything that resembles food. I have always fed mine on a whole prey diet and always recommend that over anything else. Variety is key when it comes to any animal’s’ diet. For a great food list for your tegus, I strongly recommend taking a look at this page. It is so comprehensive; I will let it speak for itself. Like any animal you need to build trust with them or you will have an animal trying to defend itself every time you come near. Let them come to you and spend as much time with them as they will allow. They are naturally curious so with proper respect and patience they will come to learn and know how to respond to you, and vice versa. There are a few different strategies for taming that I have learned and tried over the years and may help in the process. Remember that there is more than just one main thing that has to be right for tegus; everything has to be complete with their husbandry. In some cases, some things just don’t work for certain animals; therefore, you may need to accommodate accordingly.Wear an old shirt (one that you’re ok to not get back) for a couple days at work or for a couple of rigorous workouts to sweat it up and then leave it with them in their hide. This helps them associate your natural smell with safety. Keep an occasional eye on the shirt as after a while it will just be dirty, ripped to shreds and can be removed and replaced if needed. One of my favorites is using the bathroom technique. Safely carry them into the bathroom and let them explore (pre-clean the bathroom and tegu-proof it). They will start to cool down eventually and will seek out warmth. Being the only warm blooded body in the room, the tegu will come to you and enjoy sitting with you to utilize your heat. I do this for no more than an hour or so to allow them to return to their enclosure and resume proper heat and comfort. Tegus don’t shed like snakes (all in one piece). Oftentimes, one part of their body will start shedding before another. Make sure they are well hydrated and, if needed, provide them an extra bath in order to assist the shedding process. It is common for reds to require extra help. Keeping up with a proper diet will assist with the shedding if its a healthy shed, but if it’s a continual problem you may need to adjust your humidity or diet. They shed better when humidity levels are at 70-80%. Everything is interlinked so if one isn’t right they all suffer.